The call when it came – hajime! Let me be clear: until November 4, 2016, I was a person who hated flying. Specifically, lift off and landing. Not to mention, the only reason to arrive at an airport is so you can get the heck away from it. So flying to Phase II Weapons Intensive from Vancouver, BC to Oakland Airport (Alameda Aikikai) was not high on my priority list of fun activities to take up on an early Friday morning. Plane flights transformed me from an ever pivoting agnostic, to an atheist, back to an agnostic, then miraculously into a cold-sweating quivering mass mouthing prayers to Hindu, Pagan, Jewish God/Goddesses, as well as chanting ancient yogic mantras to myself until a manageable level of serotonin was released into my bloodstream to balance out the cortisol shooting through my veins. However, on a previous flight to the other end of the country in August, I happened to encounter a seat mate who was even more terrified than I was. She dropped an Ativan on the floor and was frantically searching for it. After finding it she immediately swallowed it – which rattled my slight germaphobic OCD. Nevertheless, I talked to her through the take off and landing to the point of calming us both. So when we lifted off at 5:05 am on November 4, I found myself reading without interruption, only feeling inconvenienced that we weren’t already there. In Aikido, we are asked to back onto the mats, leaving our footwear pointing outward, leaving what is unnecessary off the mats. We are meant to train unfettered by the tethers of our daily dramas, emotional ties, and monkey minds. 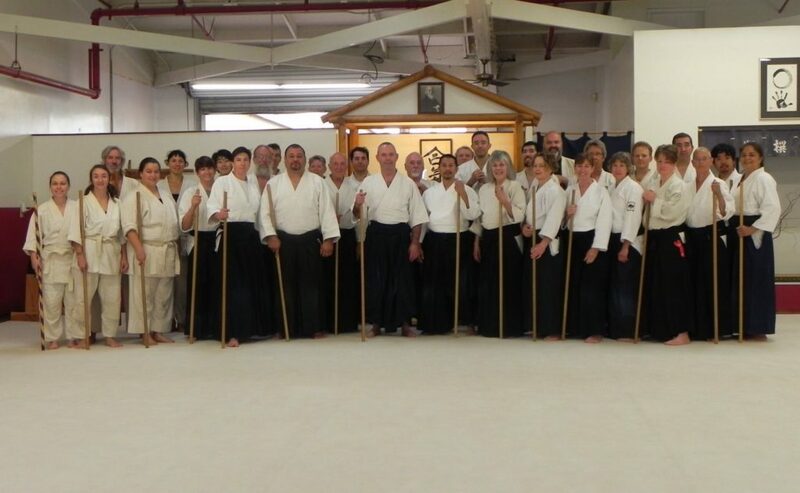 This was never more important than at Phase II of the weapons intensive lead by Mike Flynn, Shihan, hosted by Elmer Tancino Sensei, with Deena Drake Sensei (San Diego Aikikai), JD Sandoval Sensei (Hayward Aikikai) and Steve Thoms Sensei (Eugene Aikikai). A quick recap of the previous years’ intensive lead into Sancho I, II and III over the 11 hours of training. But bokken was first. A recap of kiriotoshi foundation forged the basis of understanding ma-ai, “stickiness” and connectedness in the six kumitachi. With the expectation that advanced students knew the forms, foundational concepts like precise footwork, concise sincere attacks and demonstration of the fluidity of ma-ai (contraction and expansion) were covered. We needed to use all of our senses to be aware of our environment, our neighbours and our partners. If you’ve been training in Aikido weapons, you know you are going to be hit at some point in your training. In some ways the difference in training in Aikido and other martial arts is that we practice NOT to be hit, whereas in others we are training to be comfortable being struck repeatedly. So what happens when we do get hit by a weapon? So what about being hit? In Aikido we do not have the constant batter of sparring – conditioning our bodies and minds to accepting being struck. So when we are hit with a bokken or jyo we might be surprised by our response. This is especially true when you don’t see it coming. A dojo full of flying jyos can lead to just that – a jyo coming from behind because of a kesa meant for someone else. In his book, “Meditations on Violence”, Rory Miller goes into detail on the effects of adrenaline and states of consciousness in a fight or after receiving a blow to the body. The ability to remain totally and completely present is completely misrepresented in action movies (as if we all didn’t already know that!). When we are taken by surprise or hit hard enough, a myriad of reactions take place in the body and mind. Adrenalin shoots through our veins, our fight or flight mechanism kicks in. But we might also notice that we can have strong emotional responses: explosive anger; disabling grief; regret, guilt (I did something wrong); shame (I am wrong) – reactions that seem overblown to the actual situation. These biological reactions well up to the surface unwelcome, often leaving us embarrassed and unsure of ourselves. Aikido practice can offer fertile ground for exploring our deepest, hidden, habitual emotional reactions. A respected teacher told me that we can train ourselves to recognize these reactions, “get under them” without shutting them down, remain present and continue to train. It takes self reflection, presence of mind in the moment, and as ever, training. 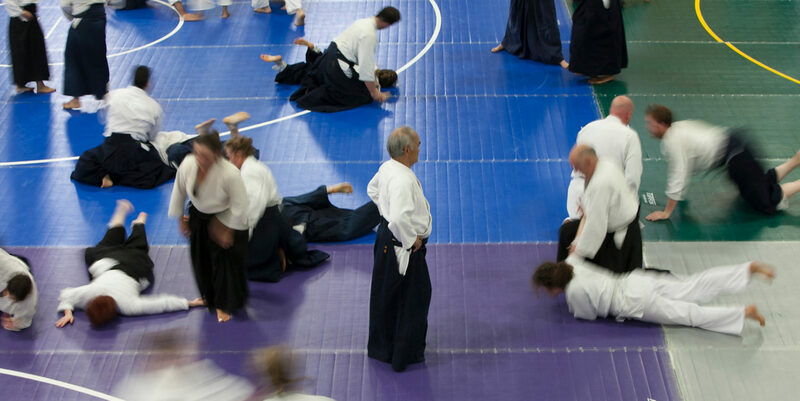 Our teachers tell us that understanding Aikido is a lifetime practice. The techniques, the art, the training. Maybe Aikido is also the lifetime practice of understanding ourselves.